This is it. We have reached our 25th episode. Thanks to all of the fans that listen who made this happen. So, how do we celebrate our 25th episode? We invited one of the members of the Atomic Geeks, our sister podcast, to join us. In the fourth chair for this rodeo is Michael Digiovanni. And our topic this week? We steal a franchise topic from the Geeks. Yes, this week, we do a Redo. 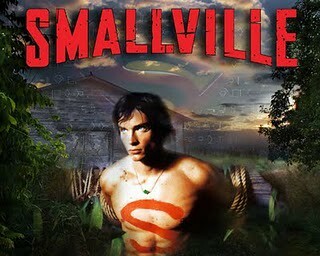 And we are redoing the WB/CW show Smallville. It’s an interesting discussion because three of us are comic book guys and one of us isn’t. Plus, for the most part, we are all divided on how we feel about the show as a whole. So listen to us take apart this show and examine what was done right, what was done wrong and how the four of us would have fixed it and made it better. This entry was posted on February 21, 2012 at 10:03 am and is filed under comic books, Superman, TV shows with tags Nerd Lunch Podcast, podcast, podcasts, TV shows. You can follow any responses to this entry through the RSS 2.0 feed. You can skip to the end and leave a response. Pinging is currently not allowed. I was a fan of the series. I watched the first four and a half seasons, then stopped watching for a bit and picked back up in season nine and ten. I’m probably more of a fan than the other guys on the podcast. Essentially our podcast is a 1 hour show talking about pop culture topics. There are three of us plus one guest host. You can either listen to the show online (via the Feedburner link) or you can download it via iTunes and listen on your iPod or iPhone.